A Hamilton car dealership has pledged its financial backing to budding young footballers of the future. 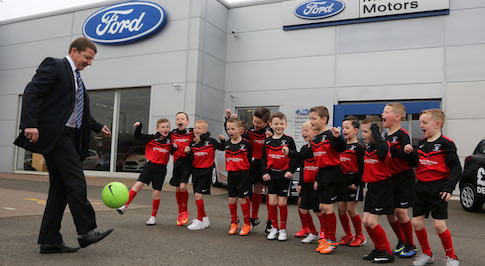 Macklin Motors Ford in Hamilton, which is located on Whistleberry Road, is supporting Mill United 2007's, enabling the team to purchase a brand new set of strips. Established in 1977, Mill United Boys Club is made up of teams from a range of different age groups. The club has produced several players for senior professional clubs, including former Scotland internationals Barry Ferguson and Paul Hartley. Stephen Devanney, who works as a workshop controller at the dealership and is secretary and coach of the team, said: "I would like to thank the dealership and Macklin Motors for their generous support of the team. Raising money for new strips and the cost of running a football club can be very hard work, so we are very grateful for the support, which will aid the team's development and contribute to their future success." Alexander Sharp, General Manager at Macklin Motors Ford in Hamilton, said: "Supporting local causes, including sports clubs, is very important and we are always looking at ways where we can support the community, so we were more than happy to support Mill United. The club has a rich history and we hope the support will benefit the team and allow the players to progress their sporting ambitions."